. . . and how it came to be. I've been asked to give a, "brief history" of the gazebo/bandstand in the park, but this won't be brief. In the early 70's the park at the corner of Green, Brown and Hess Streets was anything but the green space a park should be. It was an area paved with gravel and broken blacktop littered with broken wine bottles. The few pieces of, "free form" concrete play equipment were covered with graffiti. It had been designated as a playground, but no children would play there. The playground was nameless. Just as the park has no, "official name". Residents call the park, "Newcom School Park" for the school that stood on the same spot for nearly a century. The school was built in the middle of the nineteenth century, but had held it's last class in 1913. After that time it had been converted into a warehouse. Finally it was demolished sometime in the 1950's. The building may be gone, but I can tell you the foundations and some very hard remnants lie just below the surface. The playground was an attempt to leave just another vacant lot in an area of urban renewal. The area of Burns-Jackson came under scrutiny in the early 1970's when money ran out to demolish every thing and new uses had to be found for the existing buildings. When a few houses had been sold for, "restoration", the City decided to do something to improve the looks of the playground. Early one Saturday morning in 1975 a group of us met in the park to speak to City planners about what "we" wanted the park to become. Notes were taken and the planners went back to City Hall to work on the plans. We didn't see these plans again until about 6 weeks later. We offered our suggestions and said we really didn't want it all concrete as it was planned. Another plan and model were brought out in a few more weeks and the OHDS gave its approval. What happened to that plan is anyone's guess. The park had, "things" that eluded any description. We didn't know what some of them were until we actually saw the final plans and read the labels. We were OK in figuring out the water fountain and the sand box. (Neighborhood cats called it a, "litter box".) Other things had us mystified. 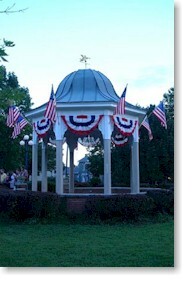 The "bandstand" was a octagonal platform surrounded by high brick walls. If a band tried to play there, the only thing that would have been visible would have been the tuba. The block where there is now a flagpole was designated as a, "fountain", but no water pipes had been installed and there was no drain. The strange pillars that resemble altars and partially hidden by shrubs were to be posts for wrought iron fencing that never appeared. Finally, part of the remaining old blacktop was designated a, "play court". Over the years the street trees that were so common in the area had died of neglect and old age. Most of the houses also had a "new look" with very little in the way of mature trees. After a couple of successful tours the OHDS decided there was enough money to plant new trees in the tree lawns and a plan was developed to pay for them. The OHDS would pay for half the cost and plant any tree in the tree lawns if a home owner would pick up the other half. It was after the first few trees were planted that a new problem surfaced. Street lighting. In the 50's Burns-Jackson was, "a high crime area" and the City asked DP&L to install mercury lights on their poles to brighten the streets. These lights were placed very high to prevent vandalism and now they were above the tree tops. Historic lighting had been brought before the Society membership a couple of times over the years, but when DP&L came back with the figures, the subject was dropped. The costs were estimated at, "$49,000 for engineering and at least $2,500,000.00 for fixtures and installation." The OHDS sent out questionnaires in the early '80's asking what the residents would like most in the, newly designated, "Oregon Historic District". Number 1 was "Historic street lights", number 2 was "a gazebo in the park" and number 3 was brick street paving. It was decided to investigate street lights again when we qualified for a $50,000. Neighborhood Initiative Grant. I've always suspected that we weren't told of the grant until the last day in the hope that, "that rich neighborhood" wouldn't get it. The paperwork was rushed through and dropped on the Priority Board's desk in less than one day. A quick trip to "Becker Electric" gave us the specifications for lighting fixtures and the number needed for the District. A map was made indicating where the lights should go to provide maximum illumination of the street. A plan was worked out wherein the City would make the actual purchase of the fixtures and the Society would do the installation. After buying all the fixtures and installing them, we had a new problem. We had $17,000. left over that we had to, "use or lose". We ran into the same problem with the gazebo as we had with the lighting. The quotes were out of sight. Again we had to do it on our own. The first concern was fire, so cut Indiana limestone pillars were specified for the base. The limestone would match the stone already in the park. Above those, wood would work. The pillars were too high and hard to climb to make fire much of a problem. 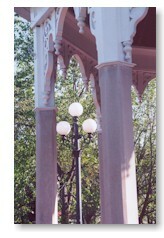 The gazebo should look, "historic" so pictures of other Ohio bandstands were used as a guide, but not copied. The gingerbread bracing was copied from porch trim on 6th Street and Clay Street. Plans were drawn up on some typing paper, a materials list was written out and submitted to the City to approve. When the bids were approved, the actual work began in late June of 1984. The first thing that had to happen was to cut down that *&^&% wall. The limestone cap was already loose so it wasn't much of a problem. The brick portion took more effort. The whole wall was cut down to provide comfortable seating. More electrical outlets were added at the same time. Next holes for the footers for the limestone columns were chiseled thought the pavement. This is where Newcom School was found. 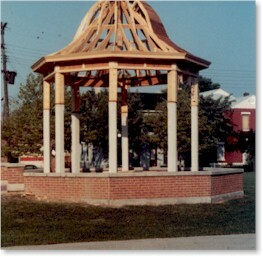 It was figured that since the limestone walls had held up the school, they could also hold up a gazebo and those were used for the column bases. After a couple weeks of chiseling and chipping, we were ready for the stone columns. The columns were delivered and set up. It looked like, "Stonehenge West" for a couple of weeks until the concrete that had been poured around the bases had set and the next phase could begin. It only took a couple of vacation days to put up the wood framing for the roof and rafters. The actual sheathing of the rafters took longer. Hollis Weaver would call out the length need for a piece of cedar sheathing, it would be cut and passed up for him to nail on. Then the next piece could be cut and the process repeated - endlessly for two solid weeks. Ken Simpson had volunteered to cut out all the gingerbread and that kept him busy for a couple of days. When he finished the City ran an audit to see how much money we had in the account. We still had too much! The limestone columns, wiring, wood and all the rest had only cost $7,000. We had to spend more! The plans for the cedar shingled roof were scrapped and it was decided to have a copper roof installed. That would cost a few grand. Still not enough though. A weather vane was added and to run up the cost and be "historically accurate" the copper was burnished and gilded with 24 Karat gold leaf. The rules were bent to allow the purchase a paint sprayer and plantings for the park. In the end the City still got back about a thousand dollars. Kathy had worked with me on jackhammering the floor on our second date. That was a rainy Fourth of July of 1984 and wanted to get married there as soon as we finished building it. We made it just in time. The date for the wedding was June 22, 1985. She had suffered for this gazebo and wanted to get some use out of it. It was she who got the busted lip from the boards I was trying to get out of my 1984 Chevette hatchback so she could make her exit. I still say it was an accident, but she doesn't buy that. It was here where she learned to, "find, retrieve and fetch". We were the first of many couples to marry in the park and we haven't killed each other as yet. The closest we came was when we were actually building the bandstand. As far as I know, only a couple of bands have actually used the building for its intended purpose. They've told me the acoustics are excellent. If so, it was by accident. I do know that if you stand at a certain spot and speak all your words echo back to you. That's the spot where we stood on our wedding day.